I figured I'd post this lasagna recipe before the new year and people start being concerned with calories and fat. Because this lasagna is full of both. I could barely believe my eyes when I saw the ingredients: 2 stick of butter, a cup of heavy cream, 5 cups of cheese..... my arteries are clogging just thinking about it.... my mouth is also watering. I toned it down a little. I only used 1 1/2 sticks of butter, and I subbed fat free half and half for the heavy cream. I figured there was still plenty of fat elsewhere to make up for it. The verdict? Oh my, so good. Creamy, cheesy, flavorful. I loved the mushrooms and bell peppers in it, and I think you could really play around with the vegetables and cheese. Pepperjack would provide a nice kick, and spinach would also be yummy added in. This isn't a fast throw-together meal, but if you are having company over, it is perfect make-ahead. And your guests will thank you for it. Preheat the oven to 350, and grease a 9 x 13 inch baking dish. To make the cream sauce: Heat the olive oil over medium heat in a large saute pan. Cook the onion, celery, mushrooms, red pepper, and garlic until the onion is translucent, about 5 minutes. Stir in the parsley, salt, and pepper. Set aside. In a large saucepan or stockpot, melt the butter over medium-low heat. Whisk in the flour 1/2 cup at a time, whisking after each addition. Add the chicken stock 1 cup at a time, again, whisking until smooth after each addition. Increase the heat to medium, and cook, stirring constantly, until the sauce thickens to the consistency of cream soup. Stir in the cream, Parmesan, salt, pepper, Tabasco, and nutmeg. Heat until the cheese is melted and the sauce is smooth. Stir in the sauteed vegetables and remove from heat. Cook the lasagna noodles in a large pot of salted water according to the package directions. Drain the noodles and seperate them so they don't stick together (hang them around the edges of the cooking pot). Spread a thin layer of cream sauce over the bottom of the baking dish. Layer 5 lasagna noodles on top, and follow with half the chicken, 1 cup of the jack cheese, and 1/3 of the remaining cream sauce. 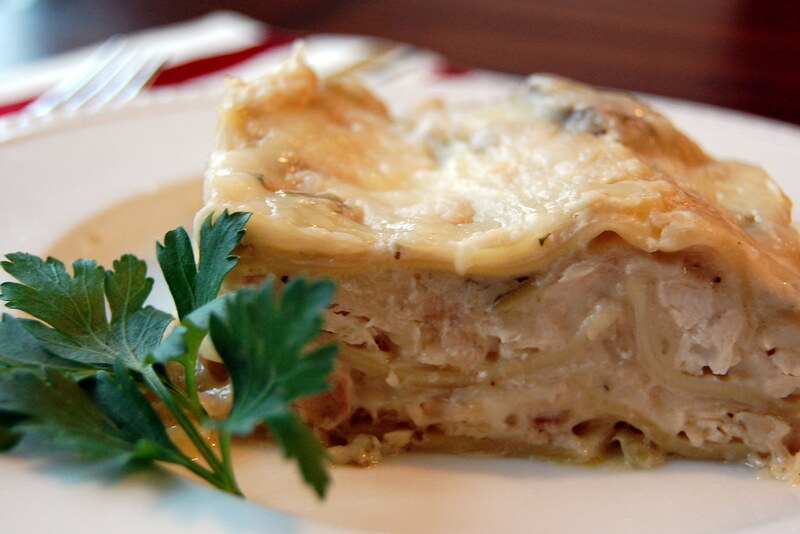 Repeat the layers of noodles-chicken-cheese-sauce. Top with the remaining 5 noodles, and cover with the remaining cream sauce. Mix together the Parmesan cheese and the last cup of jack cheese, and sprinkle evenly over the lasagna. Bake 30-45 minutes, until the cheese is melted and the lasagna is bubbling. Allow to sit at room temperature 15 minutes before cutting and serving. mmmm... this is my kind of lasagna! and i wouldn't even think twice about the calories :) it's the holidays!!! Following you back from the hop...I love finding new recipes!